The Pearly King, Queen and Pearly Prince in their traditional regalia with their cart advertising shopping in The Marsh, Waterloo. 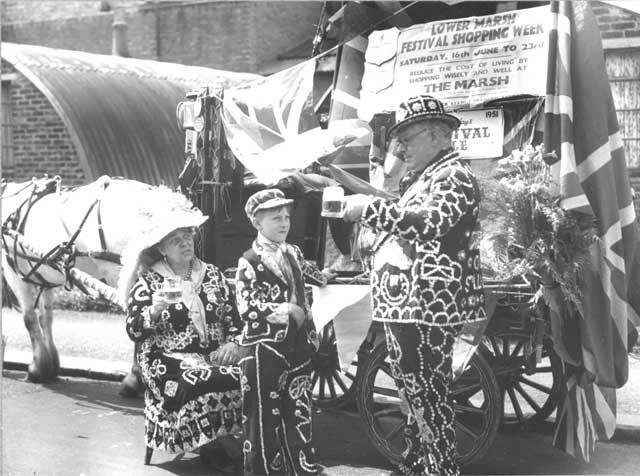 They are seen here waiting to take part in the Lambeth Festival Week procession, a yearly event established to boost community morale after the war. Note the Nissen huts in the background, still standing reminders of World War II when the picture was taken on June 16th 1951.